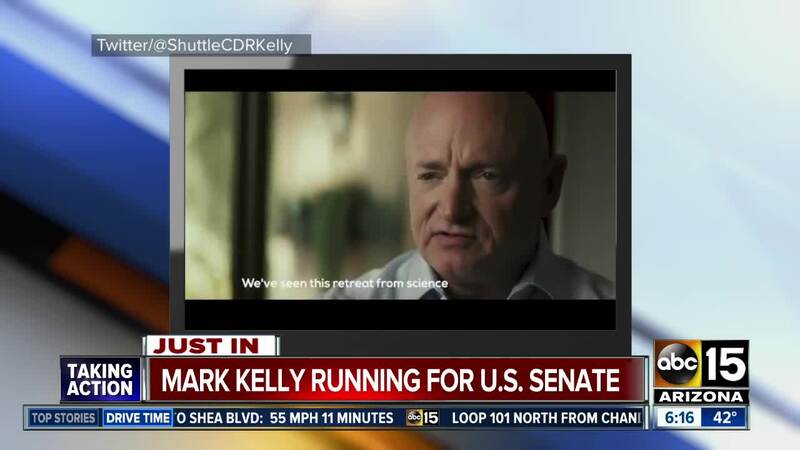 Retired astronaut Mark Kelly, who rocketed to the national spotlight when his Congresswoman wife Gabrielle Giffords was shot in a failed assassination attempt, announced Tuesday he's running to finish John McCain's last term in the U.S. Senate. PHOENIX — Mark Kelly, the retired astronaut and husband of former Congresswoman Gabby Giffords, is running for late John McCain's Senate seat. A video was posted on Kelly's website Tuesday, showing that his run for Senate in Arizona is his "next mission." Gabby was seriously injured when she was shot in the head during a Tucson constituent event in 2011 that left six people dead and others wounded. They now live in Tucson. Gov. Doug Ducey appointed McSally to the vacant Senate seat after his first appointee, former Sen. Jon Kyl, resigned after only a few months in office. The seat is a top target for Democrats because McSally just lost a Senate race in November and Democrats posted a strong showing in the November election, winning three statewide contests and picking up legislative and congressional seats.